You've heard it before and you'll hear it again -- drinking water is good for you in a whole bunch of ways, including improving digestion and clearing up your skin. But for many people, getting enough water over the course of the day is a challenge. Maybe you're a slow drinker, or rarely get up from your desk -- which you should do anyway! Perhaps you don't like the taste of water or just forget about drinking it until it's 11 pm and you're two cocktails in. We feel your pain which is why we've come up with this list of tips and tricks to incorporate more water into your day. Bonus: several of these ideas have nothing to do with drinking at all. Here’s the list … and let us know if you have any clever strategies of your own. The trick to this is pouring yourself a glass of water before bed and then drinking it as soon as you get up. Even if the thought of pouring water down your throat right away feels overwhelming, try it for four days in a row and see if you don't start doing it automatically after that. There's are plenty of apps out there to keep track of your water intake, if you like that kind of reminder (Daily Water Free, e.g., is a favourite). But another option is to set an alarm on your phone or calendar to remind you to drink every two hours or so. Yes, that's right -- your caffeinated (or decaf, if you're so inclined) morning beverage also has plenty of water in it, so you can include that in your count. According to WebMD, their diuretic effects do not take away from also hydrating you. There's no science here, just pure superficiality that somehow still works. If you have a nicer water bottle, you may just be more inclined to use it. We love. e.g., one glass option that holds one-quarter of your daily water intake in one go! There are plenty of fruits and veggies that contain a fair amount of water, including cucumbers, iceberg lettuce, watermelon (obviously), strawberries, grapefruit, zucchini, radish and celery. Plus, of course, the many other nutrients this produce contains. When you're bogged down at work, even the 20-foot walk to the kitchen can feel too far, so set yourself up for the day with a big bottle -- or even a pitcher -- in the morning so you can dip into it all day. We know, you've heard enough about "infusing" your water to last you a lifetime. But it really does make it taste better -- and has the bonus effect of even more water, if you use some of those hydrating foods we mentioned. 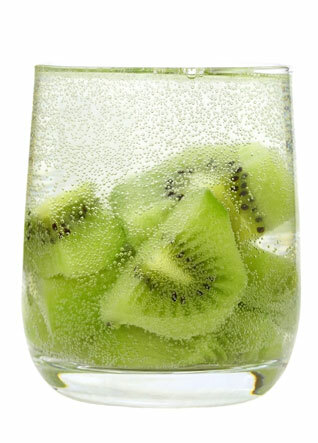 Some other good options: kiwi, lemon, strawberries or grapes. No one's expecting you to give up other drinks entirely in lieu of water, either sugar-filled or alcoholic. Instead, make yourself a deal -- for every "other" kind of drink you have, drink a glass of water. If you've gotten out of the habit of rinsing out your mouth after brushing your teeth, now's the time to start setting that glass by your sink again. A rinse, a refill, then a few gulps -- and like that, you're hydrated before bed. We love this great idea from Instagram user FunFit_Ca. Whether it's on Instagram with #watergoals or with a pal in the office, a bit of healthy competition never hurt anyone. 1: Aryeh Leib Lerner (Israel), May 27, 2015, 6:58 AM. 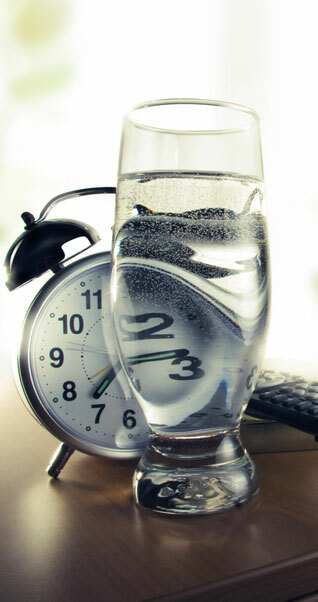 As for "X", once one has reached a certain age drinking a glass of water before bed obviates the need for a wake-up call. Who needs an alarm clock when you've got a bladder! Comment on "12 Ways To Drink More Water"